You only need a handful of ingredients to make a cloud. Water, and maybe a few tiny particles of salt, dust or soot tossed together in the atmosphere is all it takes. And yet that simple concoction results in dozens of cloud types, including some that feel not of this world. 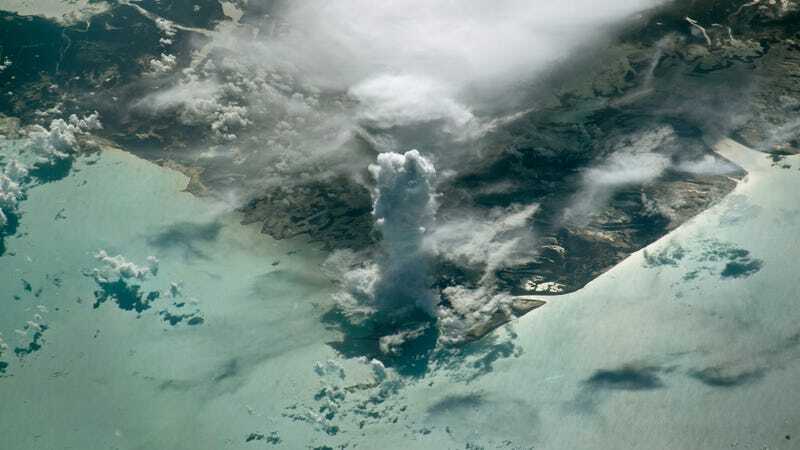 Take, for instance, the photo above, of a lonely cloud towering tens of thousands of feet above the Bahamas as seen by astronauts on the International Space Station. NASA Earth Observatory, which published the photo on Monday, said it’s in the cumulus genus of clouds, but it’s the large adult son version of those puffy cumulus clouds you drew in third grade. Specifically, it’s a cumulus congestus. The atmosphere has to be unstable for these behemoths to form. That allows moist air to rise, and as it cools, the water droplets turn into clouds. The photo was snapped in July 2016. That’s primetime for these types of clouds form in the Caribbean and eastern Atlantic, when moisture is plentiful and ground temperatures are at their hottest. It’s also primetime for afternoon rain showers, which cumulus congestus can produce, according to the World Meteorological Organization’s Cloud Atlas (yes, that’s really a thing). While the cloud might look like a thunderstorm to your average observer, cloud heads know a serious storm is unlikely to happen unless it gets extremely cold in the upper atmosphere, transforming it into a cumulonimbus. There are two types of cumulus congestus, known as altocumulus castellanus or stratocumulus castellanus. Classification depends on the height of the cloud’s base, which is, uh, not so easy to interpret from space, so the exact species of cloud in the photo remains a mystery. The clouds derive their surname castellanus from their resemblance to castle turrets, but I couldn’t help but think it looks like something captured by the Hubble telescope. It’s a good reminder that we have some pretty amazing things right here on Earth.